Lentils and Lace: New FitFlop Loosh sandals – WIN! Summer is here and while we’re revamping our wardrobes and stocking up on all the latest fashion trends for the warmer days, we simply must include summer sandals in the mix. Shoes have a distinct advantage over clothes, because they do not “discriminate” against size and/or height. You can’t grow out of them either, so you can buy all the shoes that your heart desires. The obsession with luxury shoes has been around almost as long as consumerism has existed, but it’s been mainly the domain of a select few amongst us: those that can afford the addiction. Women seem to have moved on from that rarified obsession, though. Now we are looking for shoes that ooze with comfort, style, elegance and are a little bit sporty, which happen to make it all more accessible. Fashion trend, huh. This season we are really spoilt for choice, but there is one brand that provides the ultimate in care for our feet. This is the “Loosh” summer sandals by FitFlops. 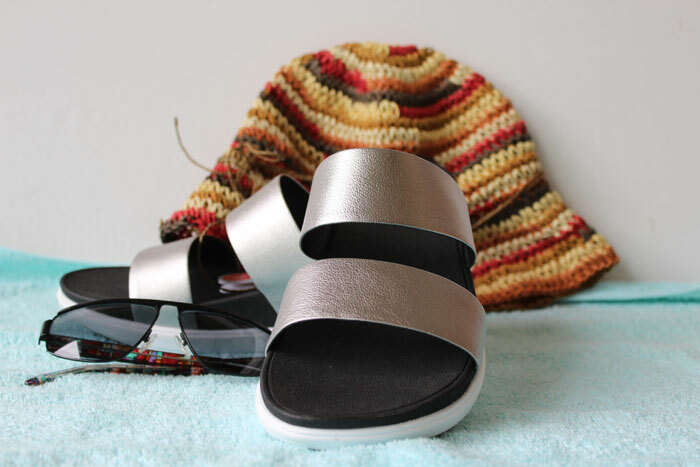 These super-comfortable, sporty-gorgeous leather slides have lightly padded upper straps and are ultra-comfortable underneath, while giving the foot and heel support while walking. The Loosh slides have a built-in arch contour and microwobbleboard midsoles. These have been engineered by biomechanists to deliver extraordinary comfort, help to absorb shock and diffuse underfoot pressure. They are also available for an average to wider foot and are slip resistant. They are designed to take impact and give you added protection in wet weather. Being lightweight, they make walking a breeze as they provide good shock absorption. This is definitely a must-pack for the summer vacation. The Loosh FitFlop sandals are available in various colours, which make them easy to accessorize with for almost any function. Wear with a dress for an evening out; or pair with a shorts and t-shirt for a day at the pool. As you get older, the feet tend to get longer and wider, so it is good to buy a pair of sandals in the evening when the feet are at their biggest. Always buy the size that fits your feet snuggly, as this will prevent the feet from slipping forward and causing discomfort. To keep your FitFlop loosh sandals looking good throughout summer, caring for them are just as important. They must be stored in a clean dry area to avoid the leather from becoming brittle. Clean the cushion layer on the midsoles with a damp cloth and dry well. I prefer using an antibacterial wipe to clean the foot-bed before storing, as this prevents bacteria settling in. Bicarbonate of soda can also be sprinkled inside and left overnight to absorb any moisture. So, if you looking for the ultimate sandals that gives you stability when you walk while looking classy this summer, then you have to try out these new FitFlop Loosh sandals.